Ms. Brief m. eigenh. U. der drei Astronauten. To Herrn Sorensen, Chief Custom at the Fornebu airport in Oslo. The crew thanks „for your cooperation and assistance during our visit We know that our visit entailed long hours and hard work on your part, but we also know that your dedication to your profession would permit nothing less“. - Mounted to cardboard. Signed by Neil Armstrong, Michael Collins und Edwin „Buzz“ Aldrin in black ink. 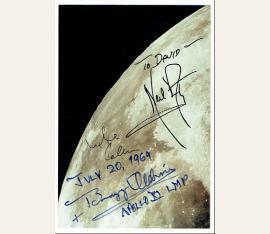 Authentic autograph from that early period, not even three months after the moon landing are very rare. The Apollo XI crew visited Oslo forv„Goodwill Round-the-World Flight Tour“ from 10th-12th October 1969. Signed photograph of the moon. 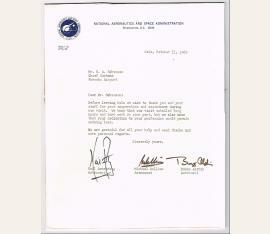 Signed by all three astronauts.